The Plum Brook reactor primary building as seen by an artist in 1956. 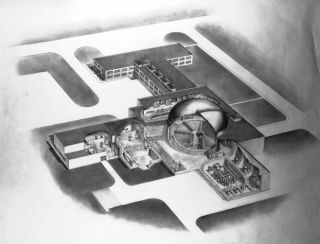 In this historic photo from the U.S. space agency, a 1956 artist's schematic of Plum Brook reactor primary buildings with a cutaway of the containment vessel revealing the quadrants, the reactor pressure tank, and the lily pad. It was called the lily pad because, with water in the quadrants, the circular center resembled "a lily pad floating on water."